PC Eraser™ supports FAT, FAT32, and NTFS. On the hard drive there is a list that Windows uses to keep track of where files are located on the hard drive. When you delete a file and remove it from the Recycle Bin all you are doing is removing the file's name from that list. The file is still on the hard drive, Windows just doesn't know where it is any longer. But special recovery software can still easily find the file again and put it back on that list for windows. Once CD package seal is removed or broken, CD may be returned for exchange or replacement only. When you need to remove applications it is usually best to use the Windows add remove software function then use the PC Eraser's "Scrub Free Space". Scrub Free Space takes a long time so you need to approach the problem in an organized manner. First thing to do is to use PC Eraser to destroy any data files that you need to such as spreadsheets, word documents, and so forth. Next go to your Computer's control panel and double click on "Add/Remove Software". Windows will generate a list of all the registered programs installed on your computer. Use this list to uninstall any programs you wish to get rid of. This may require you to reboot your machine and return to this list several times. Once you have all of the registered programs removed close the "Add / Remove Programs". Next go through your hard drive and find any unregistered programs that you want to remove and add their folders to PC Eraser's Erasure List. Once you have found all of these hit the "Destroy Now" button. Now that all of the desired applications are removed from the system the final step is to "Scrub Free Space". No, PC Eraser™ was designed to operate on Windows 98, ME, 2000 and XP. The delete function simply removes the file name from a list that Windows uses to keep track of where files are. PC Eraser goes beyond the traditional delete function. PC Eraser works on the file's information to make it extremely difficult to recover. It then clears the file from the list of files. If "C:\" is selected and the "Destroy" process is started, PC Eraser will cycle through your C drive and erase everything it has access rights to. In order to destroy a file PC Eraser requires modify level access rights and also requires that the file is not open by another program. On average the end result is that Windows would lose much of its functionality and in some cases become completely unusable. All Data files that are not secured would also be destroyed. The answer is a qualified No. All of the recovery tools used by the development team to test PC Eraser failed to get files back after PC Eraser had been properly used. However, if the "Scrub Free Space" has not been used yet there is a possibility that an older copy of the file might be recovered from a different "unused portion" of the hard drive. If this fails you might take your hard drive to data recovery specialist to attempt a physical recovery. There is a small chance of at least a partial success, however be warned that this method is too expensive for the average user. Basically it is an economics decision, balancing time against security. The more time the erasure method takes the harder it is to recover a file. The Quick Method makes a single pass, while this is enough to lower confidence of recovery for most software based methods it can be defeated with relatively small expense. The low end DOD 3 pass method is harder to recover from. The recommended level (DOD 7 pass) gives the best balance of time versus difficulty of recovery and in the majority of cases actually requires a physical recovery from a data recovery expert at great expense and no guarantee of success. Finally, the Guttman is the most extensive operation making 35 passes. Guttman takes the longest period of time. Free space is a jargon misnomer. When file list points to a physical location on a hard drive that location is referred to as being in use. Otherwise it is "free space." This "free space" can compromise the security of a computer's files. Scrubbing free space is the process of applying PC Eraser methods to these unused locations on the hard drive. To illustrate the need lets imagine that we work for the government and have a program called Social Wizard (this is make believe software, but it will demonstrate a real world problem.) The job of Social Wizard is to keep track of social security numbers for large lists of people. In fact the list is too large to be manipulated in memory. The program opens a file called "c:\between30And35.dat". The user makes a change to the file, and since the list is so large a temp file is created called "c:\~between30And35.tmp". The changes require 100 social security records be copied to the temp file for processing. Once "Social Wizard" is finished making the required changes the temp file is deleted. The program just used Window's delete functionality, and even though you don't see the temp file "c:\~between30And35.tmp" in the recycle bin 100 social security records have just been exposed to hackers. Why? Because the Window's delete functionality just removes the reference to a file from a list of file names. But the file is still intact, just not visible to Windows. Worse yet, because	Windows can't see the file you can't secure the file using access rights. This same scenario takes place a thousand times a day on any given computer. Scrubbing free space helps to fix this scenario by applying the PC Eraser methods to this unreferenced file. To transfer the license from an old computer to a new computer you will need the version and stamp number printed on the PC Eraser CD. 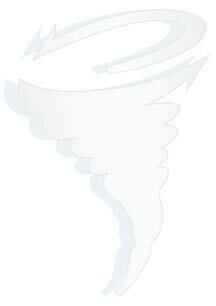 Go to http://support.thetornado.com/requestKey.htm, fill out the form completely. Once you have finished click on the submit button. Once our staff has reviewed our sales records you will be contacted with a new software key. Once the new software key has been issued, PC Eraser must be removed from the original computer (see	removing software from Windows) before installing on the new computer. Failure to do so will result in violation of the End User License Agreement. No. Per the End User License Agreement you may not resell, distribute, lease, loan, reassign, or rent out the PC Eraser. An extension is the end portion of a file name after the final dot. It is the primary way of determining what software a file can be manipulated by without actually attempting to open the file. For example, "hello.doc" is a document file that can be opened by Microsoft Office. In "hello.exe", the "exe" stands for executable which is an example of a program (i.e. list of instructions for Windows.) The Protect Extensions List identifies types of files that you don't want PC Eraser to destroy. If while destroying a list of files PC Eraser encounters a file with one of these extensions it simply skips it, leaving it untouched. In order to give your system true protection you will want to use a combination of "Protect Extensions" and "Protect Files And Folders". The best use of the Protect Extensions Feature should be used to protect the operation of your computer. Inside PC Eraser if the "Protect Extensions" button is clicked you will see an "Add Recommended Extensions" button. This button will populate the Protect Extensions List with most of the system critical extensions, but this list may not be complete depending on your systems configuration. Remember, this list is not complete. It is only a minimum suggestion. In order to give your system true protection you will want to use a combination of "Protect Extensions" and "Protect Files And Folders". Also remember to save your changes to this list before you close it. If during the destroy process PC Eraser encounters a file or a folder listed in The Protect Files List it simply skips it. This is the most effective way to protect your Windows functionality. By protecting system critical folders you prevent PC Eraser from removing files that Windows needs to operate correctly. The folders that you need to protect vary depending on how the computer is setup. There are possibly more files and folders that you will have to protect depending on the manufacture of your computer. For example many manufacturer's have started adding a Recovery partition (an additional drive letter on your hard drive such as "D:\") that contains the original computer configuration. There are not any standards in place for this so you will need to check with your owner's manual to see if this is the case. Notice that "C:\Documents And Settings" has not been selected. You need to exercise caution here. This folder should not be added to the protection list, because that would prevent you from erasing files and folders that you might want to. But do not erase this folder. Do not erase subfolders either unless you expressly created said subfolder. The only time you want to erase subfolders off of "C:\Documents And Settings" is when it is either a folder that you created, or the subfolder belongs to a user that has been removed from the system and you don't care about that user's data. There are a variety of websites that specialize in identifying file extensions. Try http://filext.com. Smart Computing also has a website at http://www.smartcomputing.com/editorial/article.asp?article=articles/archive/r0701/69r01/69r01.asp that has a good listing. Yes, absolutely. And there are several methods for accomplishing this. The easiest is to create a special folder on your C drive called tornado. From there you can create as many subfolders as you need. Copy the files you want to keep to this folder or one of its subfolders as you see fit. Once you have all your files collected connect your Tornado™ to your old computer and to your new computer. When the File Transfer Utility is up and running simply drag and drop the "c:\tornado" folder from your old computer to the C Drive on your new computer. Another method you can use is to use MS Backup to create a complete backup of your old computer as a backup file called "c:\mybackup.bkf". And then transfer that file over using the Tornado™ same as the other method. Once "mybackup.bkf" has been transferred to your new computer you can use MS Backup to selectively restore your files. This method is safer and more efficient though it requires a little more experience to accomplish. If you are interested in the MS Backup method click on "Start->Help", Type in backup in the search box and then hit enter to get a list of help pages. You can also go to the internet and search Microsoft's website for backup. On top of that most Computer Distributors/Manufacturers such as Apple, Best Buy, and Dell have programs in place.